Saint John Paul the II described his priestly vocation as a gift and a mystery. 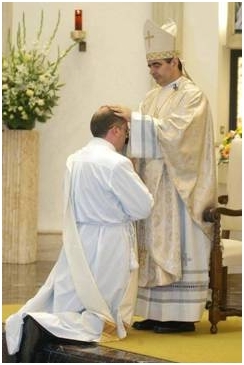 I have seen that the priestly vocation is a gift because it is totally unmerited, and is never separated in your heart from the love of its giver, a love that endures forever. The gift testifies to that love, because the more perfect a gift it is, the more it suits you, and the more it shows how much the giver knows and loves you. The vocation is a mystery because is a part of God’s Providence that always has something more to say, and will only be fully fathomed when we meet Him face to face in Heaven. A vocation, which is the calling God extends to each and every one of us on this earth, is a gift and mystery of the mirabilia Dei (the wonders of God) in a life, and, like the Israelites in times of the Old Testament, and the budding Christian communities of the New Testament, the mirabilia of God aren’t confined to one past moment in history, nor can they be contained in one moment of history. In times of light and darkness they shine through, reminding us of the past, illuminating the present, and promising the future. They occur in the grandest moments as well as the most intimate ones of our lives. 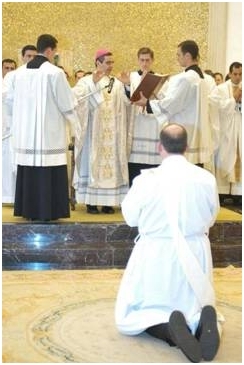 Today I celebrate the tenth anniversary of my priestly ordination, and it continues to be a gift and a mystery. This morning, during my meditation before the Blessed Sacrament, I meditated on the ten years of priestly blessings that I have received. I’ve come to the altar on many days with joy, some days with tears, but every day bringing the intentions of the whole world with me to entreat Our Heavenly Father through His Son to bless and protect my flock and all those in need of prayers and grace. I’ve considered every soul I’ve tried to help as a member of my constantly expanding flock, which I remember in prayer at every celebration of the Eucharist, asking the Lord to hear their prayer intentionsand to watch over them. This morning in I concelebrated, in the same chapel where I was ordained a priest, the Solemnity of the Immaculate Conception with all my Legionary brothers of the Center for Higher Studies in Rome, presided over by our General Director. Four of my brothers, my former students, received the ministry of Acolyte and, God-willing, in May will be ordained deacons as a step toward their own priestly ordination. I remembered you all in my Mass, in gratitude for the gift of the priesthood. 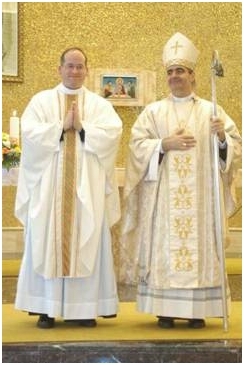 I am grateful to all of you for your prayers and support in these ten years of priesthood. Please count on my prayers and my priestly blessing.